Last week, Daisy Beecher began Advocating on Pet Pardons, the facebook app that allows users to get involved in saving the lives of real shelter pets. Being a huge animal lover, Daisy was thrilled to support such a lifesaving and noble cause. Through Pet Pardons, Daisy became aware of the heartbreaking and tragic reality for shelter pets in America. Due to the vast pet overpopulation, millions of pets are sitting on death row in shelters… waiting to die. For Daisy, this reality was eye-opening and heartbreaking, and she sat at her computer and wept for these precious, innocent souls who have done nothing to deserve this tragic fate. For the first time, she could see the consequence of those who do not spay or neuter their pets... the consequence of those who buy from breeders… the consequence of those who see a precious family pet as nothing more than a disposable object. For millions of shelter pets each year, their lives are the consequence. But instead of letting the pain overtake her, Daisy began taking action. She started Advocating on Pet Pardons daily, in addition to emailing and calling shelters to find ways to help or donate. She was driven by the knowledge that she now had the power to save these special lives through Pet Pardons. The very first dog Daisy saw on Pet Pardons was a death row baby in Somerset, Kentucky named #81. This precious boy didn’t even have a name… just a meaningless number with no love behind it. Daisy saw his little face, and her heart shattered. With only days to live, his chances of ever getting out alive seemed so bleak. Daisy connected with his photo in a way she didn’t know possible. Maybe it was because he was the first pet she saw, or maybe it was his adorable 1 inch legs… or the despair in his eyes, but Daisy just knew she had to save him. Upon seeing his photo, she emailed the Pulaski County Animal Shelter about adoption. When they didn’t get right back to her, she assumed the worst… and she sobbed uncontrollably. But yesterday, she finally received an email from the shelter regarding her request. 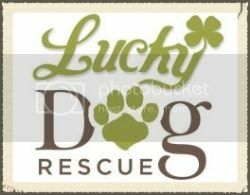 They put her in contact with a transporter who could help get #81 from the shelter in Kentucky to Daisy’s home in Connecticut! 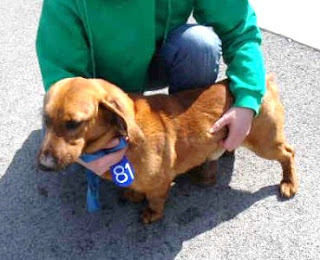 #81 was scheduled to die in a Kentucky shelter today, 4.6.2011. But because of Pet Pardons, #81 will not die. Instead, he will soon be transported to his new home in Connecticut, with a family who will cherish him forever. Pet Pardons is saving the lives of shelter pets every single day. YOU can be a part of this. YOU can make a difference. YOU can save a life. Yes, it is heartbreaking to see their photos and read their stories, but YOU can change their world. YOU can help give them happiness! With a simple click of the Advocate button, YOU can be a part of their happy ending! *To start saving lives today, Install the Pet Pardons app & click the Advocate button! 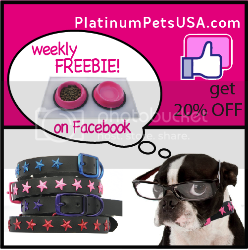 *Please “Like” the Pet Pardons fan page to do even more to save lives & share in the successes! Thats so awesome! snif snif.... I hope I can save a life too someday! Pet Pardons saves lives! So eloquent as usual. Well done, Daisy! What did she name #81? Blessings on you all. 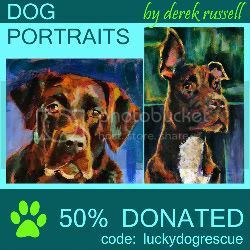 I just donated to your rescue Ashley. I am so grateful for you.